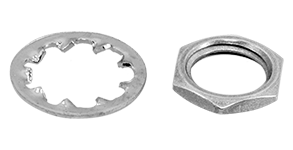 Lockwasher and nut for 82185001. Use for RF connectors and capacitors. 0.221" outside diameter nuts & lock washers. (3 sets). Samson Industries heavy hex jam nut. Silicon bronze, plain finish. 5/16" x 18 TPI. 0.562" on flats, 0.191" thick. Drake Chicago miniature nut. Fits 1/2" lenses, switches, etc. 0.52" I.D. IP# 21720P01. Super strut hex nut. Steel gold galvanized "gold guard". 1/2" nut. 10-32 stainless steel hex head insert. 0.377" across hex. 0.692" long. 3/8" rivet nut made originally for aircraft fasteners. Made of anodized aluminum. 3/4" outside diameter flange, 1/2" outside diameter sleeve, 7/8" insertion.Made by B F Goodrich. This kit includes ten 3/8" nc x 7/8" long stainless steel cap head screws, nuts and washers. Andrews distributed this kit for bolting EIA flanges, connectors and hanger kits. 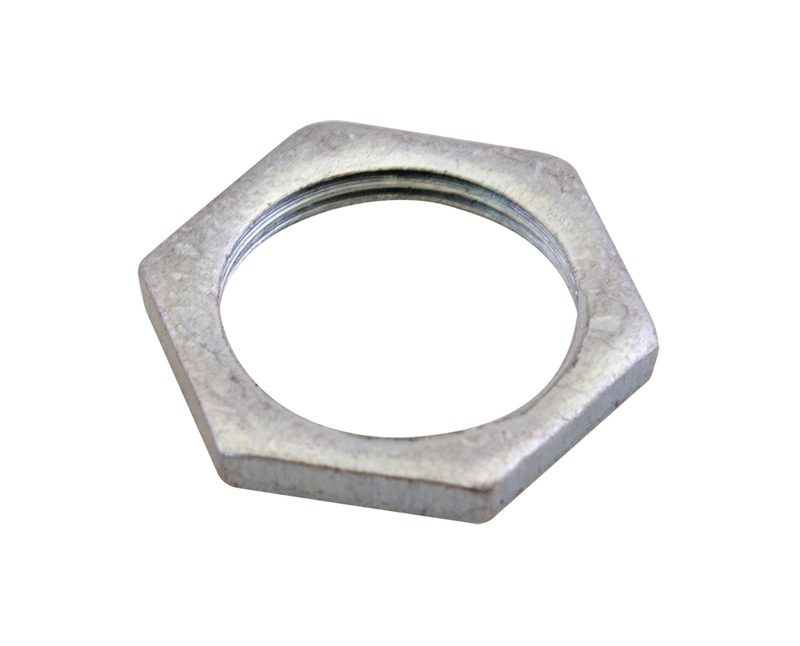 Nylock nut. Chrome plated. 6-32 winged. 1/2" x 1/4" x 1/4" high. Gates P/N: 448-0306. Knob - cap. Spun aluminum. Trim cap or fastener. Threaded center (#4-40) mounting hole. 0.438"D x 1/4". 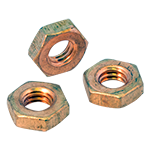 6-32 threaded insert with built-in locking serration. Non-magnetic. Brass, plated. 0.310" O.D. foot, 0.156" O.D. neck, 0.125"H neck. 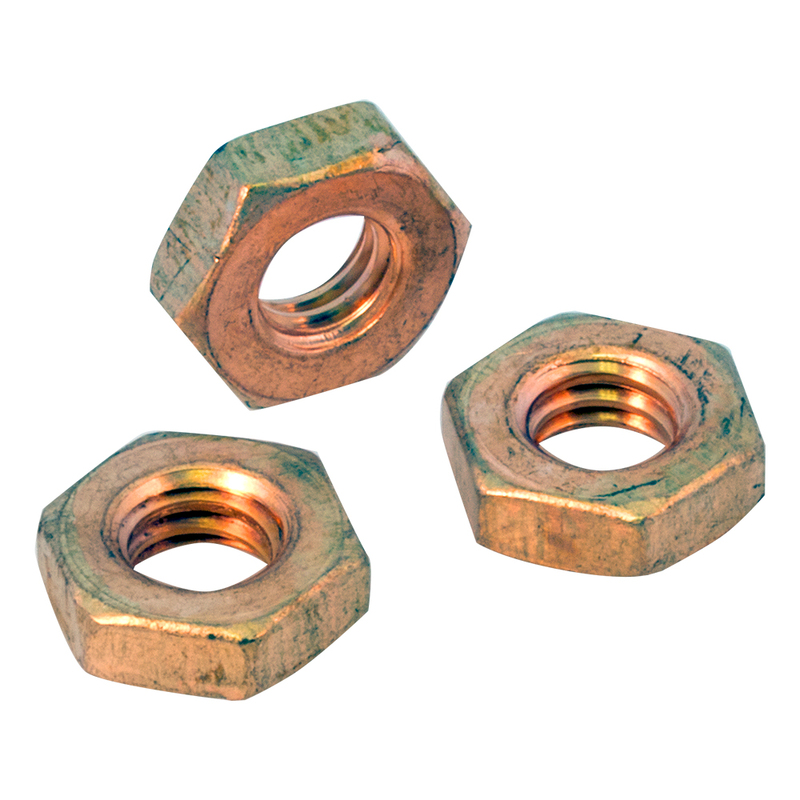 Galvanized steel speed nut. 5/8" - 11 standard bolt thread. NOTE: Bolt not included.